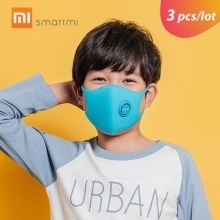 3pcs/lot Xiaomi Smartmi Anti-Pollution Face Mask For Kids Air Sport Block Respirators PM2.5 Haze Anti-haze Adjustable Ear Hanging 3D Design Comfortable with Ventilating Valve, isolated from air dust, PM2.5, Haze, pollen grain, automobile exhaust, well care of your kids&apos; health. – Filtration efficiency up to 90%, isolated from air dust, PM2.5, Haze, pollen grain, automobile exhaust. – Perfect Anti-Pollution Face Mask for kids 3-15 years old. – XXS for kids 4-8 years old, XS for kids 6-10 years old, S for kids 8-15 years old. – Comes with adjustable soft ear hanging, high elasticity. – Well care of your kids&apos; health, good anti-pollution face mask for kids wearing on the public. – With Ventilating Valve on the Face Mask, 3D design, TPU breathable material.